Restores production of a key metabolic enzyme. Helps improve hypercholesterolaemia and type 2 diabetes. Inside each of our cells is a key metabolism enzyme called AMPK (adenosine monophosphate-activated protein kinase) which plays a fundamental role in energy homeostasis and acts as a ‘life span regulator’. AMPK is expressed in a number of tissues (liver, brain, skeletal muscle) where it works rather like a ‘metabolic master switch’, regulating several intracellular systems. It thus plays a central role in promoting healthy longevity. As we grow older, activation of cellular AMPK declines. This leads to, amongst others, weight gain - because AMPK determines body fat composition – and therefore predisposes to the diseases associated with excess weight. Most Western societies today are facing a significant problem with over-consumption. Eating too many calories impairs vital functions such as healthy uptake of glucose and fat from the blood, and leads to the accumulation of cellular waste and changes to longevity genes. This manifests as undesirable weight gain, diabetes, degenerative diseases and premature death. Few people are able to successfully maintain long-term calorie restriction, and so the identification by scientists of AMPK is indeed welcome news - when activated, this cellular enzyme mimics the beneficial effects of calorie restriction including loss of surplus body fat. • enhanced activation of the SIRT1 enzyme (similar to that conferred by resveratrol) and of the P53 tumour-suppressor gene. it stimulates fatty acid metabolism in the mitochondria, helping to lower LDL-cholesterol and triglycerides. It therefore plays a crucial role in preventing metabolic disorders such as obesity and type 2 diabetes. Like metformin, it is well tolerated by the digestive system and does not require a prescription. Further confirmation of berberine’s AMPK-activating efficacy comes from recent studies that showed it promoted the multimerisation of adiponectin in adipocytes into high molecular weight (HMW) multimers. These have greater metabolic activity and are closely associated with cell insulin sensitivity. Even though berberine inhibits adiponectin expression, its activation of AMPK promotes multimerisation of adiponectin and thus helps reduce obesity and its complications. - Gynostemma pentaphyllum (or jiaogulan) , standardised in gypenosides, has also demonstrated AMPK-activating capacity. Used in traditional Asian medicine, this plant is sometimes called the ‘immortality herb’ both because it increases longevity and also has a number of other properties conferring antioxidant, adaptogen, anti-atherosclerotic and blood pressure-lowering effects. Scientists observed that in activating AMPK, administration of this herb increased fat-burning and cellular glucose uptake. Cell culture experiments revealed that it doubled fat-burning and increased cellular glucose uptake 1.7-fold. Similarly, obese rats supplemented for just four days showed reductions in triglycerides (33%), total cholesterol (13%), LDL-cholesterol (33%) and post-prandial blood sugar (20 %), compared with controls. In another study involving diabetic rats, three weeks’ supplementation with G. pentaphyllum resulted in a 35% improvement in glucose tolerance and a reduction in glucose production and glycogen in the liver . These results show how the activation of AMPK produces huge benefits in reducing circulating sugar and fats. Human studies have confirmed what most researchers had discovered in laboratory tests: that G. pentaphyllum boosts AMPK activity and offers certain longevity benefits. - Fisetin, a flavonoid extracted from the plant Buxus sinica, sends a ‘switch-on’ signal (like epitalon) to longevity transporter genes in a similar way to calorie restriction but without the need to make dietary changes. Some studies have also shown it has anti-cancer and anti-angiogenic effects. As an AMPK-activator, it inhibits – via a phosphorylation process – the Mtor signalling pathway and incites cell apoptosis in human melanoma. Restoring AMPK enzyme activity will thus help you to not only recapture a certain youthfulness, but also control you weight in complete safety. When AMPK is activated, cells are thrown into survival mode and stop storing new fat; instead they burn more stored fat – a process similar to that of calorie restriction. • it increases the number of new, healthy mitochondria. Boosting the activity of AMPK would seem to be essential, given what we know about its role within the body. Our new product is designed to activate or reactive AMPK via the action of barberry, jiaogulan and boxwood (Buxus sinica). With proven effects, these plant extracts together constitute a natural, effective formulation for supporting the body. 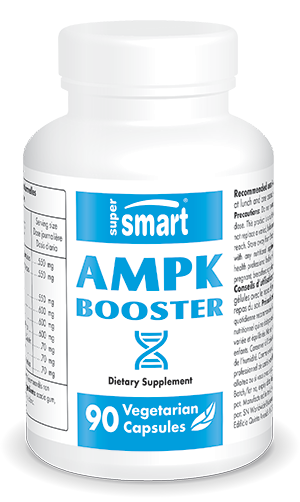 AMPK Booster is offered at a dose of two capsules a day, to be taken with lunch and dinner. You may also be interested in two other natural extracts for improving your general state of health and combatting the ageing process: Astragalus Extract and Reishi Extract. Adults. Take two capsules with lunch and one with dinner.